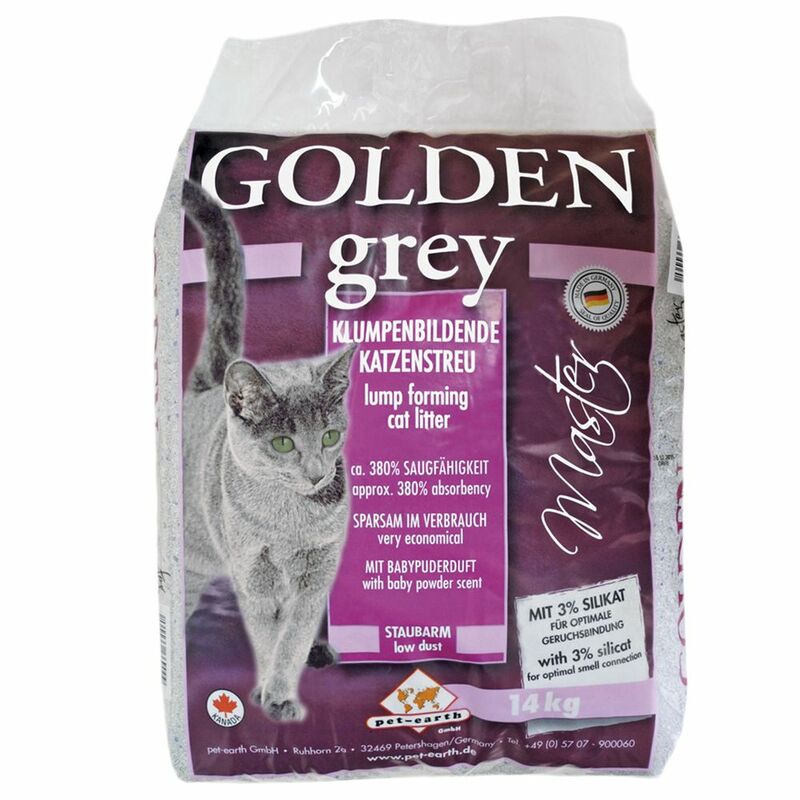 Golden Grey Master kitty litter made from fine bentonite is very popular among cat owners. Benefits of Golden Grey Master Cat Litter at a glance: Bentonite (granules size 12) With silicate - for even better odour control With baby powder scent Clumping litter 380% absorption Low in dust The clay used for Golden Grey Master cat litter is a purely natural product, so it is entirely harmleΒ for your cat. Its superior power (approx. 380% absorbency) eradicates unpleasant smells while the litter gives out a gentle baby powder scent. The litter is low in dust production and consists of extra-clumping granules that won't stick to your kitty's feet and get spread around the house. Golden Grey Master is enriched with silicate which ensures even better odour control. It is ideal for male cats and multi-cat households. There is no need to empty the whole tray to clean, you'll only have to pick out the clumps, so Golden Grey is more economical and easier to use than conventional clay. 14 kg Golden Grey are the equivalent of approx. 42.2 kg conventional litter!.